IT'S not unusual for hairdressers to have some experience with cancer fundraisers. The success of the Leukaemia Foundation's World's Greatest Shave means people like Rebecca Dean and Julianne Macdougall have been at the forefront of public efforts to raise money for a cure for some time. Now they are taking their efforts to fight the disease one step further. Gladstone's M Hair & Co* salon at Stockland, which Ms Dean manages, is taking part in this month's Biggest Morning Tea fundraiser for the Cancer Council Queensland. Both women have had experiences with cancer in their families, and the salon recently lost one of its regular customers to a rare form of the disease. "It's always hard when you get to know someone (and they pass away)," Ms Dean said. "And you do get to really know them because you talk all about your personal lives." 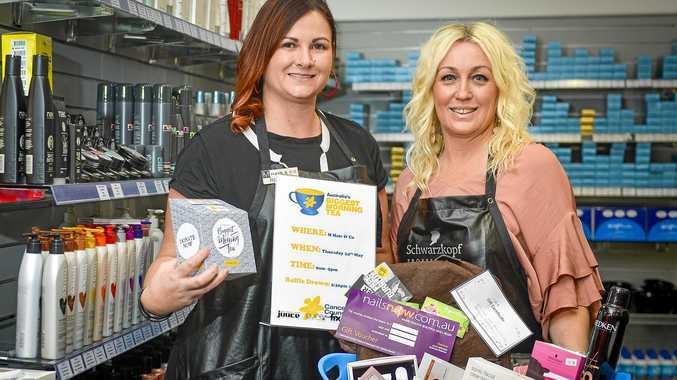 The pair are hoping to raise more than $1000 for the Cancer Council through a gold coin donation bake sale on May 24, donation tins and a big raffle featuring prizes from not only M Hair & Co but also from stores all across Stockland. M Hair & Co Staff members have also bought items for the raffle prize basket. "We wanted to do something to give back to the community, and this is obviously something that touches everyone's heart," Ms Dean said. A raffle ticket will cost $2, but you can also buy three tickets for $5. The fundraiser will run from 9am to 5pm on Thursday May 24, but tickets for the raffle are on sale now. *An earlier version of this article incorrectly referred to M Hair & Co as M & Co Hair and included incorrect information about the timing of the fundraiser. The Observer apologises for the errors.